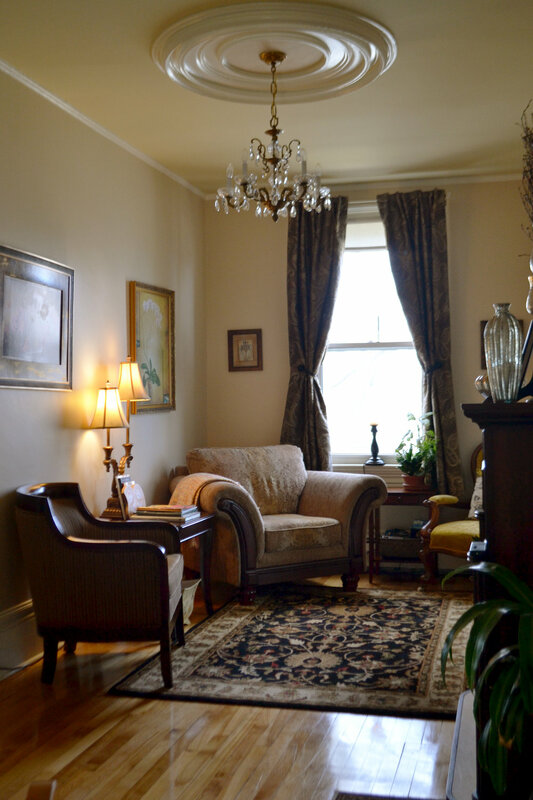 A stay at Quartermain House Bed & Breakfast on prestigious Waterloo Row in Fredericton, New Brunswick is a delightful step back in time. The lovely hostess, Debra Quartermain graciously welcomes you into her waterfront 1840’s Gothic Revival home, then woos you with tales of presidents & princesses, wraps you up in 5-star indulgent comfort & opulent pampering, and as if that were not enough, she prepares a breakfast fit for royalty the following morning. After enjoying time in the many different rooms to your avail at Quartermain House on the first floor, it is a treat to retire to your private guest room quarters on the second floor. You can slip on a luxurious authentic Turkish robe (yes, that's right - all the way from Turkey) or you might lounge in the sitting area, like my Mother-in-Law did perusing the wonderful literature surrounding you. Each guest room, has its own special decor and Debra has stocked the rooms and the guest refreshment area with everything your heart might desire. Don't miss the homemade cookies and specialty coffee & teas! The guest rooms' private baths are exquisite. One woman wrote in the guest book, that she could live in Quartermain Quarters bathroom. Another guest raved about the extraordinary MacKay bath... where else would you find a bathroom where you can read poetry from a fainting couch, while your loved one bathes in a clawfoot tub, then afterwards, you dance a tango together. Guests love it here. Much thought went into the design when renovating all guest room baths and it shows. The comfort of the bed I slept on was sublime and I can attest that a good night sleep and sweet dreams come easily here. Sit back, and don't lift a finger... well, maybe a pinky, but be prepared to be spoiled with a creative two-course breakfast skillfully prepared & beautifully presented by Debra. We started with the most delicious warm braised pears in maple syrup with roasted cinnamon dusted strawberries followed by a very tasty asparagus cheese omelette, sausages, local bakery toast brushed with warm butter, and melt in your mouth freshly baked pastries. I can promise you won't leave the Mary Tibbits Dining Room wanting for a thing because Debra has thought of everything and she happily caters to any special dietary requirements or requests. Debra goes above and beyond ensuring a memorable experience when you stay at Quartermain House, catering to your every need (even those you didn’t know you had), so much so, you feel like family and find it hard to say goodbye. You quickly settle in and never want to leave. 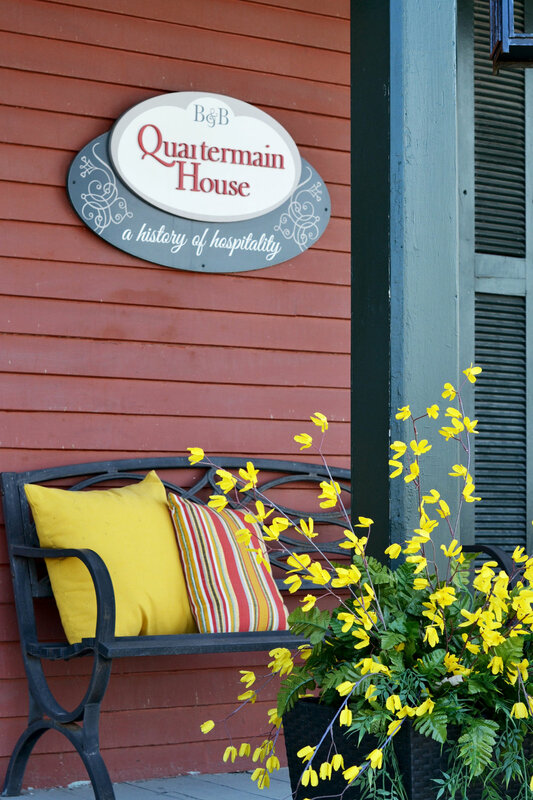 This Spring Staycation at Quartermain House was a gift for my Mother-In-Law. Even though, we both live in Fredericton, we felt ~ a world away ~ truly an era away as well. Debra's attention to detail is only surpassed by her genuine hospitality. Book a stay, whether you are from away or live close by. Do it for you, or do it for someone special. Enjoy the pampering, there's nothing like it. Return home, (I know, but you have to eventually), but do it refreshed, relaxed, enriched and most likely invigorated and all the better from Debra's 'Joie de Vivre' enthusiasm and the Quartermain House experience. This early Mother's Day celebration will be one that will be treasured for years to come. Note: When you come to stay, don't forget to pack your cute pajamas as you never know whom you might meet in your dreams. This post was sponsored by Quartermain House B & B; however, all thoughts and opinions are my own.